This year Sheri Griffith Expeditions is excited to be working with Melanie Webb of Sol Fitness Adventures to offer a brand new way to experience Labyrinth Canyon! Melanie Webb is a former wildlife biologist and environmental consultant who is now one of the Top Trainers in the fitness industry. She has been featured on Good Morning America, in Outside and New Beauty magazines, and is now a brand ambassador for ATHLETA. We met Melanie when she was a tour director for a group of guests that we hosted on a river trip in 2013. Since then, we have been working with her to create a Fitness Adventure for the River. We are excited to introduce our Labyrinth Canyon Fit Kayaking Tour this September! 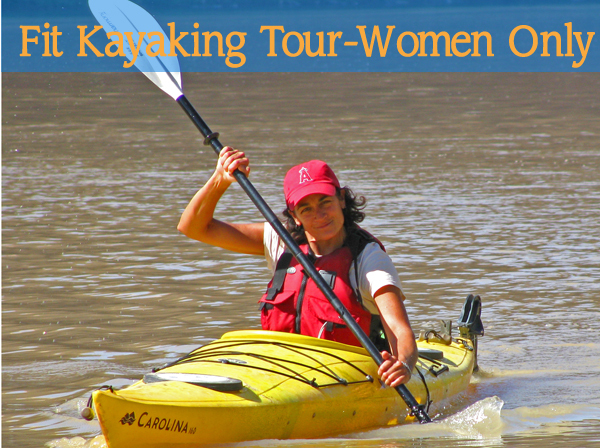 The Fit Kayaking tour will combine all of the highlights of our Women-Only Kayaking tours with the Health and Wellness tours that SOL Fitness Adventures offers. There is no experience in either kayaking or fitness necessary to have a great time on this trip. By the end of the first hour on the river, you’ll feel like you were born to kayak, and with the additional tutelage of Melanie each morning, mid-day and evening, you will find a renewed sense of wellness in mind and body.